You may be wondering how the words “cremation and art” could possibly be related? However you might be surprised to know that cremation art is a really popular option for ashes. 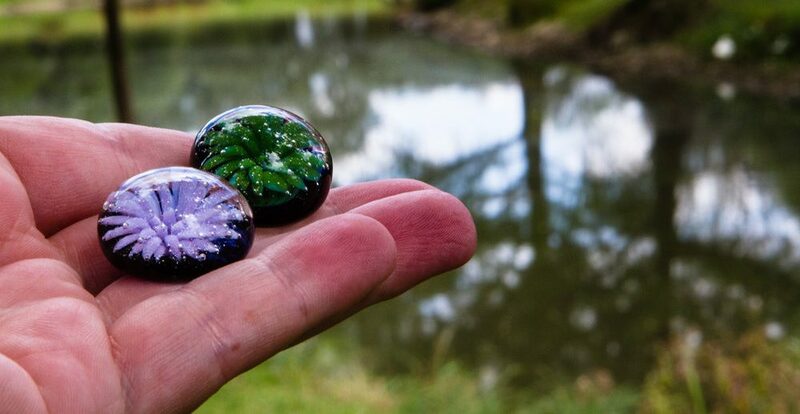 If you are seeking something more creative, beautiful, and alternative, these cremation glass art pieces might be for you. 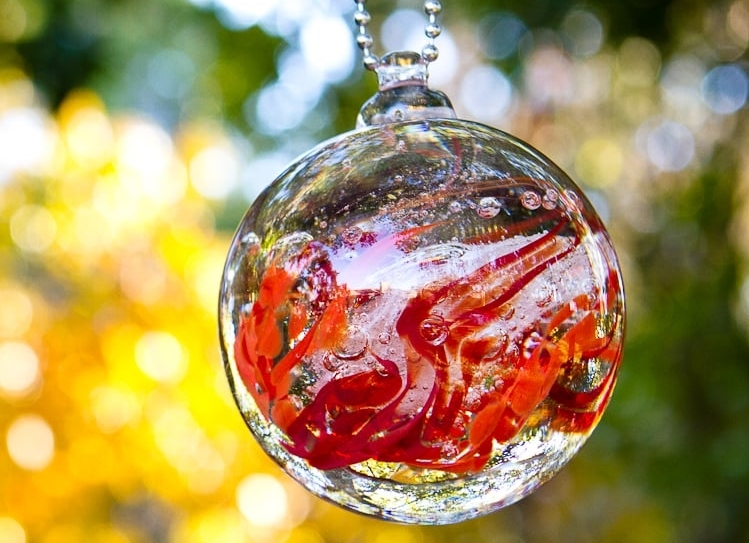 What is Cremation Glass Art? They are a strikingly beautiful choice for remembering the deceased. Most of these can provide a method of displaying the loved one’s cremains in glass. For instance, you could set them on a table in front of a window or a mantel in your home. Another perfect place would be on your patio or lawn. There are so many ideas of what to do with ashes. 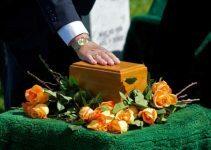 So if you are considering using the remains also for interment, diamonds, or scattering, there will be plenty of ashes for cremation art pieces as well. Fortunately, only a tiny amount of the cremated remains are necessary to create them. People who craft these stunning objects are definitely artists in every sense of the word. 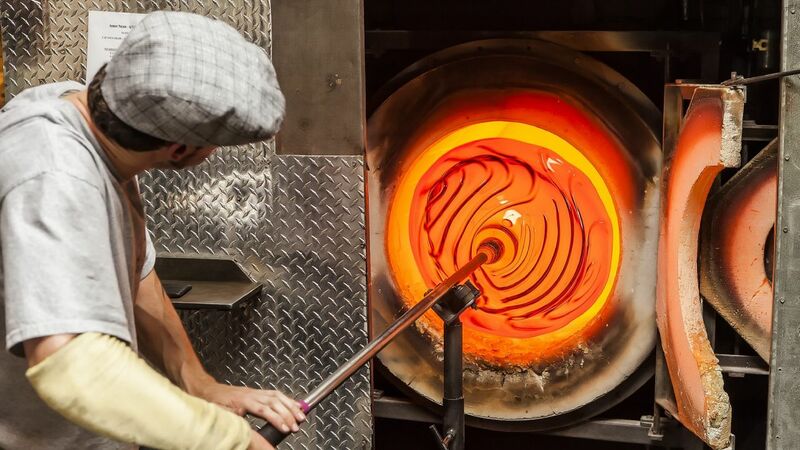 You may have even visited a place that makes blown glass art. Or possibly, you’ve seen the process demonstrated somewhere such as a festival. The artist starts by dipping a blow pipe into a container of liquid glass and scoops up some on the end. 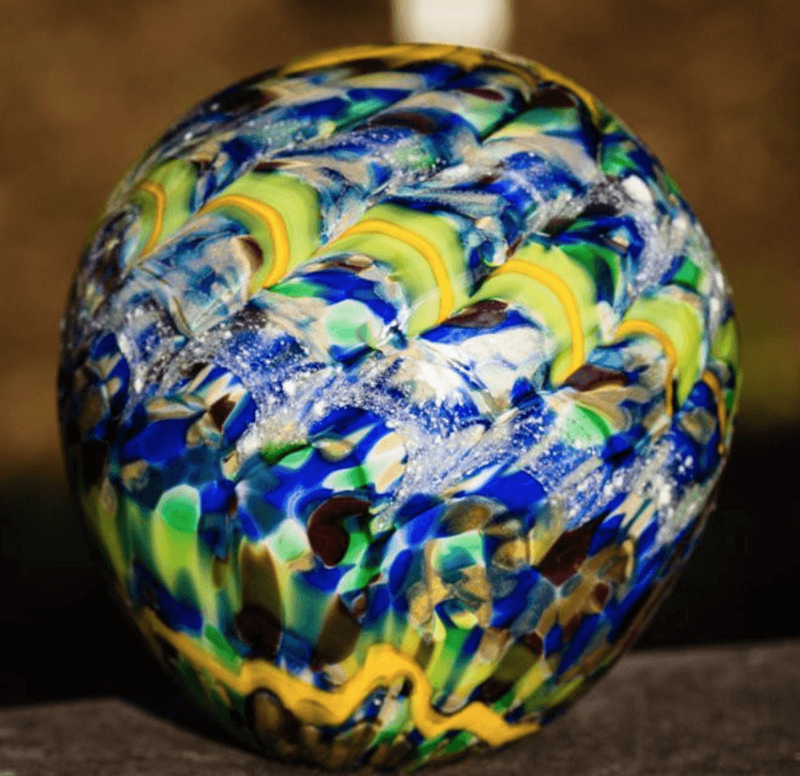 Then as someone blows into the pipe, the artist spins, manoeuvres, and molds this glob of molten glass into a magnificent work of art. Memorial glass art is made the same, however a small amount of the ashes is incorporated into the artwork. You probably have a perception that a cremation urn usually looks very traditional and standard. But you’ll be pleased to know that there are some very talented artists who have created some fantastic pieces. Below are just a few stunning memorials. 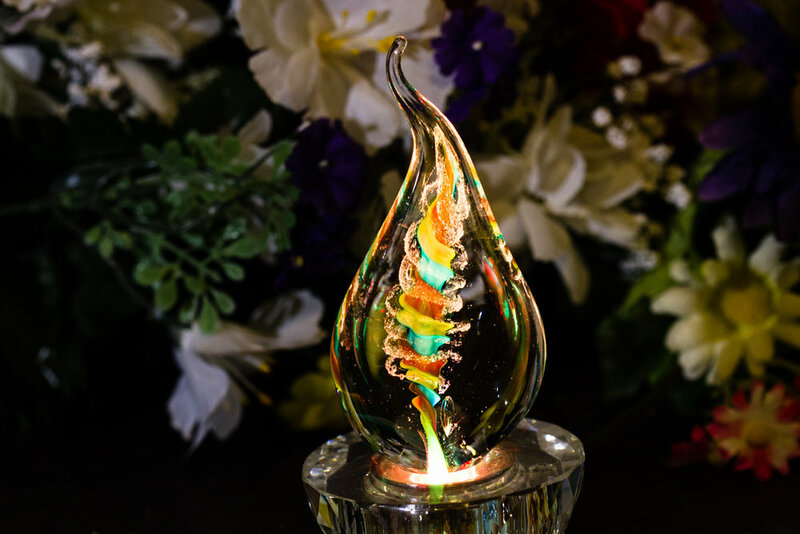 The Serenade Hand Blown Glass Urn is a beautiful example of cremation art. 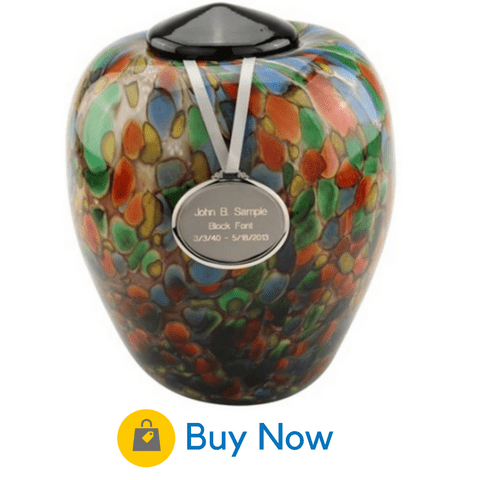 This handmade urn has a multi-color with a “sprinkle” finish that is suitable for the remains of an adult. Its unique and aesthetic design is fitting for a person who was a colorful character. This finely crafted glass urn is truly unique. 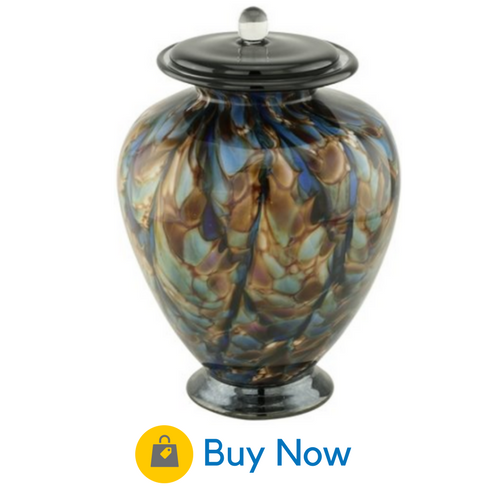 With a gray background accentuating swirls of deep amber, green, and blue, this is an urn to celebrate a spirit that was both quietly understated and daringly vivid. It’s a tall cylindrical urn whose beauty and artistry will stun visitors wherever it is placed. For a closer look at the urn and to buy, go to their online store. It’s impossible to describe in words the breathtaking beauty of this spectacular urn. The cobalt blue background is even more striking when paired with feathered ripple of iridescent pearl white. It’s vase shape will make it fit in perfectly with any decor. 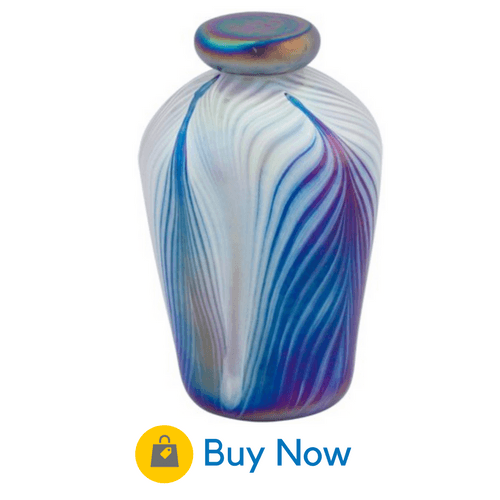 Celebrate the glowing vibrancy of your lost loved one forever with this durable and striking urn. For more information and to purchase, check out their Amazon store. 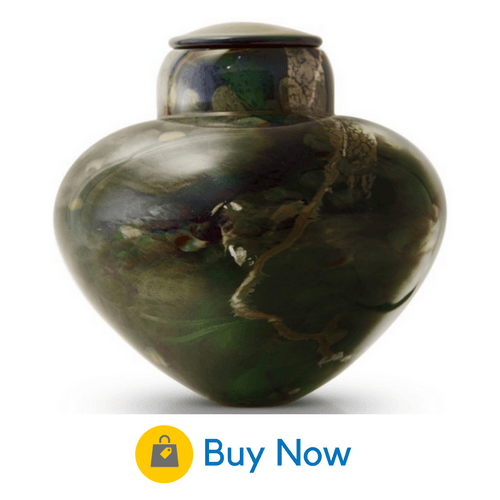 For the spirit who cherished rivers or loved shades of emerald, this urn is just right. A graceful river-like pattern of silver and gold adorns a misty emerald background, giving the urn a look that’s reminiscent of a verdant Irish countryside. The urn is solid and durable, weighing in at 8 pounds and measuring 7 inches tall. It’s an ideal way to celebrate the eternal flow of life even while mourning a death. For the best price, visit their online Amazon store for more information. As functional as it is beautiful, an artistically-crafted glass lamp keeps your loved one close to you every time you reach over to turn the light on. It’s a wonderfully symbolic way to remember their influence on your life. OneWorld Memorials have crafted an elegant stained glass reminiscent of a Tiffany lamp. The gorgeous mosaic, in varying shades of purple, displayed in the wings give an impression both of opulence and free-spiritedness. The detail of a wooden rose carved on the base completes the effect. Go to the OneWorld Memorial store to get a closer look at this lamp and to purchase. 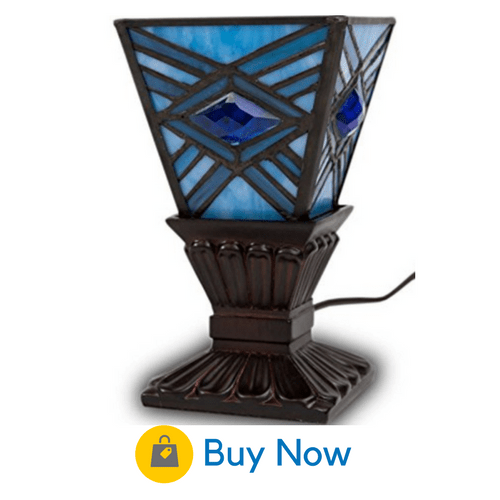 Another beautiful Tiffany-inspired option is this beautiful memory lamp. The geometric design and soothing shade of blue both evoke comforting feelings of eternity. A jewel of deep indigo set in each side makes these shades of blue even more spectacular, as if you were observing the sky and the ocean on a clear sunny day. Personal engraving can be added to the durable, resin-cast base. You can add your loved one’s name, dates, or even a special quote. Unlike the Butterfly Lamp, this memory lamp only is not designed to hold ashes. Check out their online store to purchase this elegant memorial. 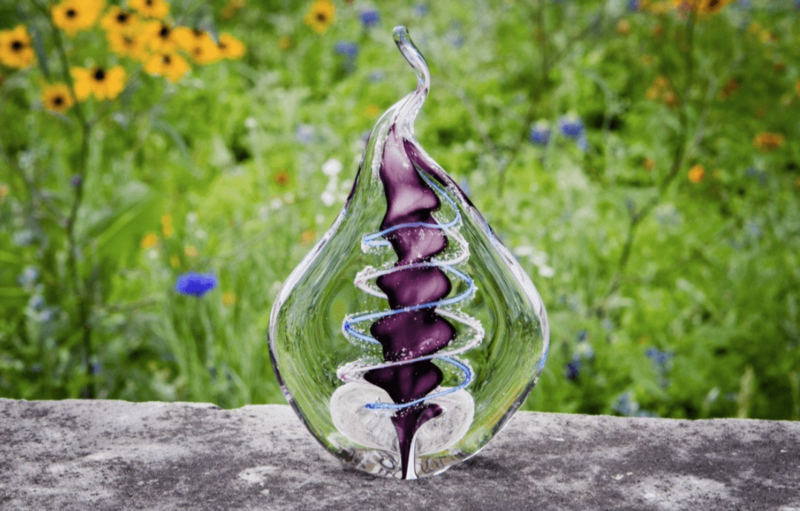 OneWorld Memorials offers another stunning option for storing ashes. 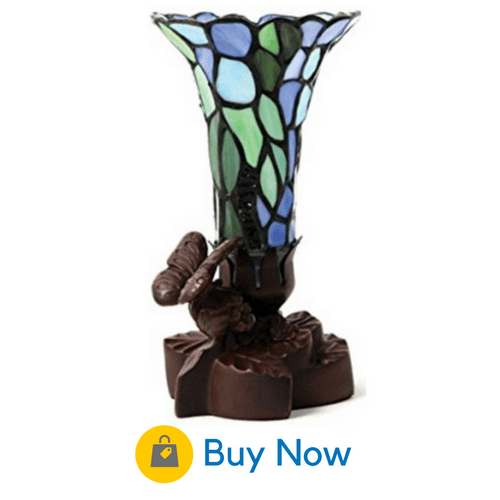 Tiffany-style stained glass pieces are arranged into a flower-like pattern in varying shades of blue and green. A sweet carving on the base depicts a climbing butterfly among tiny wooden flowers. The lamp will lift your heart even as it brightens your space. Delicate, lovely, and memorable as life itself, glass and jewelry just seem to naturally go together, especially when it comes to memorializing a lost loved one. 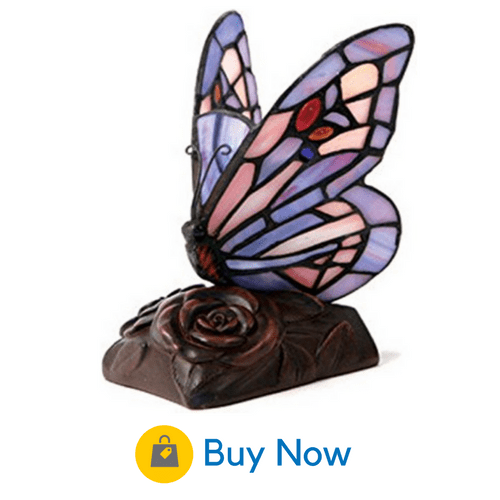 You can store a small portion of ashes in this stainless steel butterfly with glass wings. It’s like a traditional locket, only much more unique and beautiful. 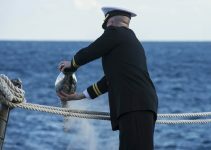 A funnel is included to make it easier to put ashes inside the tiny compartment. Another option is to place a lock of hair or a dried flower within it. The necklace comes with a 20-inch stainless steel chain and an elegant, red-velvet box. 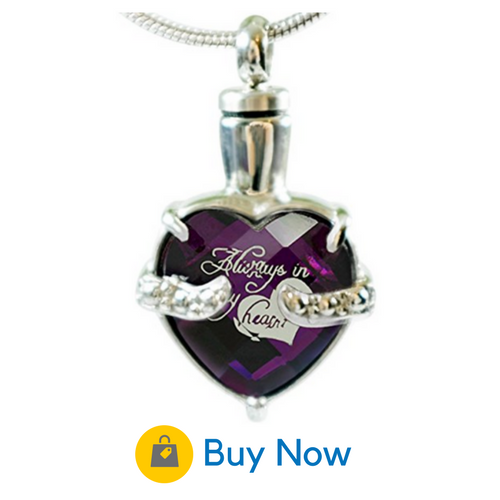 This pendant is made with vibrant purple glass is etched with the words “Always in my heart”. The pendant even comes with a fill kit and an 18-inch stainless steel chain. Both the pendant and the chain are hypoallergenic and won’t irritate your skin. They are also guaranteed not to scratch or tarnish. 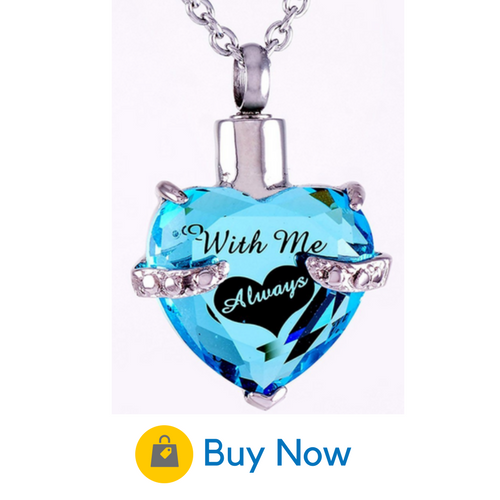 The glass pendant is a beautiful rhinestone blue with the inscription “With Me Always” laser-engraved on it. A 20-inch cross chain necklace is included with the package, as are a funnel and pick for easily placing ashes inside. The pendant comes in an elegant velvet bag. It’s a striking memento that can be displayed on a mantel or of course worn as a necklace. 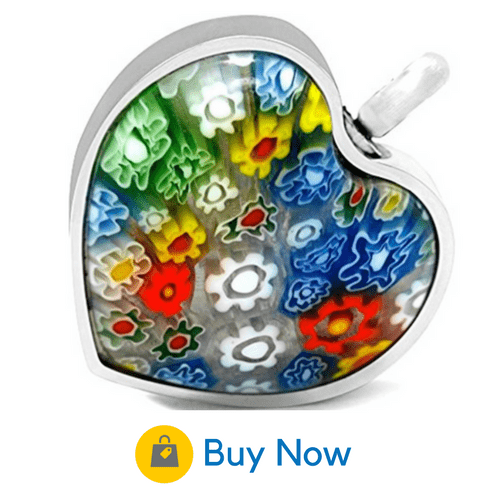 This heart-shaped glass pendant is decorated with a pattern of tiny multi-colored flowers. 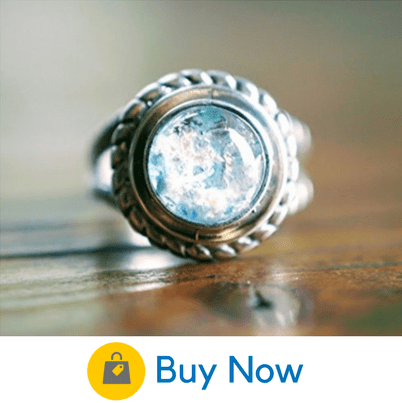 It is one of the most inexpensive options for cremation art jewelry that you’ll find on the market. Both the pendant and the chain are made of long-lasting stainless steel, with a guarantee against rust and corrosion. It’s also scratch resistant and won’t discolor your skin. Glass beads of different colors are quite popular right now. Some are strung on a silver bracelet and others on a stretchy cord. There’s no reason for it to be limited to a bracelet. Why not an anklet as well? If the memory of your loved one brings feelings of warmth and cheer like sunshine, this bracelet may be just for you. 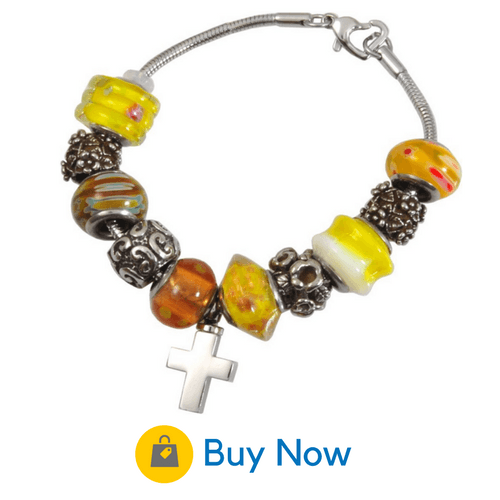 A circle of alternating stainless steel and bright yellow glass beads is adorned by a simple cross charm, which also functions as a discreet urn for ashes. You can have a deeply spiritual but sunny reminder of your loved one every time you look down at your wrist. The pieces are strung securely along a black satin cord. The ashes are stored in a stainless steel heart that is also a decorative charm on the bracelet. 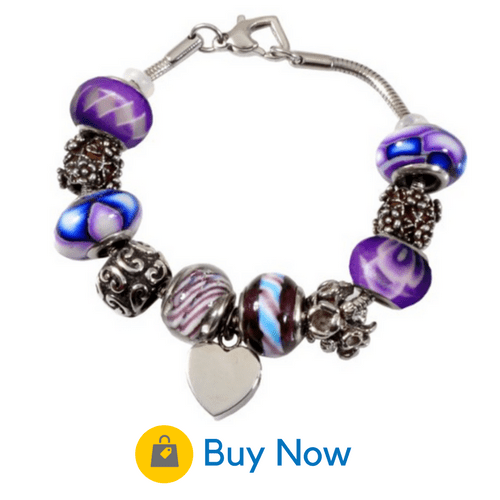 Decorative stainless steel beads alternate with pretty glass beads in different shades and patterns. There are a total of 11 color combination options to choose from such as Celestial Blue, Emerald Green, Memorial Pink, and many more. Think of how many times you see your own hands throughout the day. With a ring, you can think of your loved one each time. A particularly lovely choice is the combination of sterling silver and cremation glass. 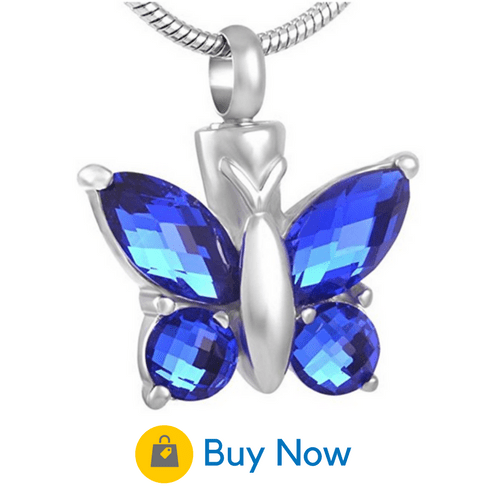 Order it in the birthstone of the deceased or in your favorite color. This is a ring that you can wear always. The design is timeless and perfect for future generations. If you love the look of delicate glass in a ring, this will be a lovely choice. In a unique process, crystal clear glass in shades of clear blue and green is melted in layers with the ashes of your loved one’s remains. The result is a uniquely beautiful and personal memento. The same spectacularly unique process and maker as the Macha ring. The ashes are beautifully layered with delicate, clear pink crystal. 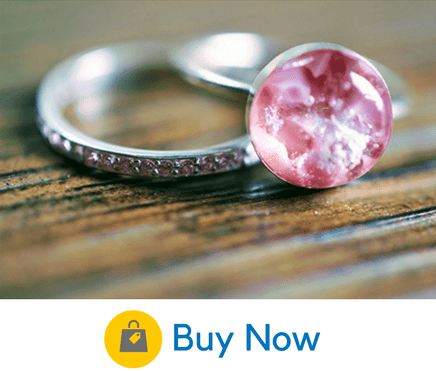 Tiny pink crystals also encircle the sterling silver band. To make your ring even more unique, you can choose from an array of specialized extras, such as a dazzling holographic effect. Each stone is handcrafted individually, so yours is certain to be different from any other, just like the personality of your loved one. Once you’ve placed your order, simply send a teaspoon of ashes in the return shipping label. Each orb is unique from one another as the light will reflect through in its own distinctive way. Choose to keep it clear with swirls of color within, or select other hues for the orb itself. They are sometimes called gazing balls. Sit them on a place in your home where there is plenty of sunlight. Watch the colors and magical reflections light the room as it shines through from different angles. Also an especially nice place is your patio or on a tree where it can capture even more light . When the sun shines through, it will have the same effect as stained glass by reflecting the multiple colors. What a nice way to keep your departed with you, even at work. You don’t have to worry about squeamish co-workers. Don’t to tell them that your loved one has accompanied you to work. They will never guess and instead, you’ll get their compliments throughout the day. An extraordinary and visually pleasing blown glass memorial and one of my personal favorites. As its name implies, it’s a flame shaped sculpture. Some are made with a glimmering spiral design, made from the cremains. They swirl up the center, which enhances the flame effect. Purchase an illuminated and revolving stand, which adds even more to the optimal effect. A new and unique method of keeping fresh flowers at your loved one’s resting place. Put them in an eye-catching blown glass vase. Imagine fresh flowers or a beautiful silk arrangement held by a vase created with your loved one’s cremains. An irreplaceable design are these complex blown glass flowers. Spirit Pieces offers one complete with a hummingbird fluttering close-by. Some varieties have a hook for hanging a tiny bottle, containing the cremains. An absolutely distinctive conversation piece. We would never forget our beloved pets and their unconditional love. It’s a particular love that can rarely be received from another person. You will definitely want a commemorative symbol to keep your precious pet’s spirit alive. Touching stones are a good choice. 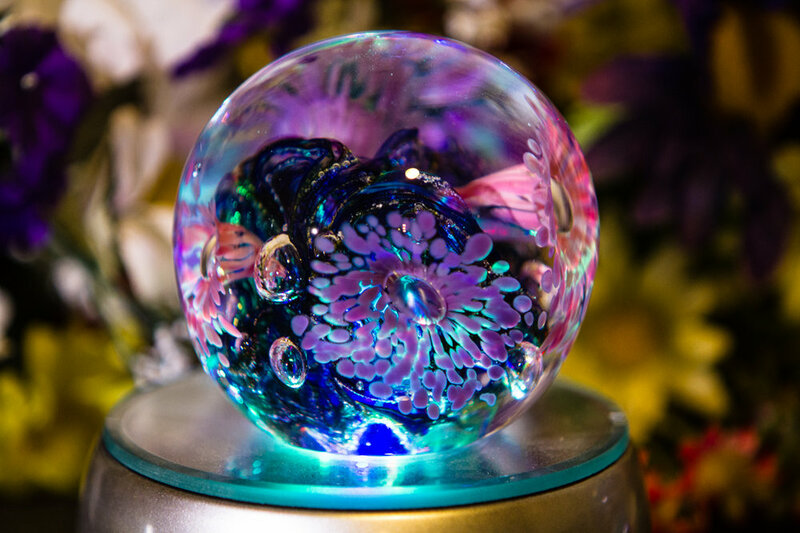 They are smooth glass stones that contain the pet’s cremains, made in multiple colors. Keep them in your pocket and the next time you have an urge to pet your beloved animal, take out a stone and rub it. On the other hand, perhaps you find yourself in a special location, such as a favorite fishing hole where you both loved to go. Take out one of the stones and toss it in the water. You’re only limited by your imagination. If you’re a cremating a pet, whether cat or dog, all of these memorials can be used. What Art Will You Choose? As you can see, there are limitless types of cremation art. Virtually, if you can imagine it, then it can be created. Furthermore, there is only a tiny amount of cremated remains required for any of these art pieces. Meaning you will still have a large amount of cremated remains to scatter or bury, if that is your wish. Any of these would be an option for sharing a memorial keepsake with people who also loved him or her. Perhaps you or your loved one had a passion for art and beauty. All of these and more would offer a memento specifically made for them. Cremation art provides a way to keep their memories alive every day. Cremation Institute Copyright © 2019.